Mark Stevenson Poster Print entitled An American P-51 Mustang gives chase to a UFO by greatBIGcanvas at UtopyaCon. MPN: 1038560_13_60x45_none. Hurry! Limited time offer. Offer valid only while supplies last. Poster Print entitled 'An American P-51 Mustang gives chase to a UFO'. An unmarked American P-51 Mustang gives chase to a UFO over mainland America. 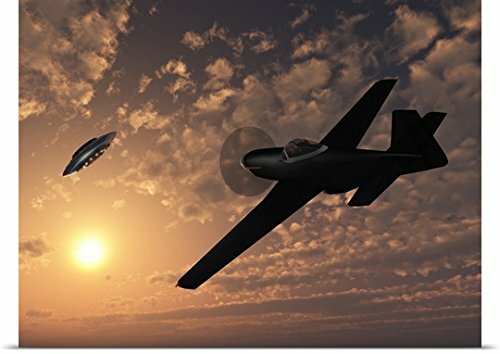 Poster Print entitled 'An American P-51 Mustang gives chase to a UFO'. An unmarked American P-51 Mustang gives chase to a UFO over mainland America. Multiple sizes available. Primary colors within this image include: Light Yellow, Black, Gray. Made in the USA. All products come with a 365 day workmanship guarantee. Archival-quality UV-resistant inks. Printed on high quality gloss finish paper with archival quality inks. Looks great in dorm rooms, kid rooms, offices, and more.